Toshin Sequeira, a final year undergraduate from the Singapore Management University’s (SMU) School of Economics, was named a Schwarzman Scholar this week. Flying the SMU flag high, Toshin persevered in the face of stiff competition from more than 2,800 candidates from China, the United States, and around the world, to secure the coveted scholarship. He will be one of 147 Schwarzman Scholars to undertake the programme in August 2019. The two-stage selection process for the Schwarzman Scholars Programme is rigorous, with an acceptance rate of less than 5%. Besides an online submission of content, Toshin travelled to Bangkok for an interview with a panel of senior experts. 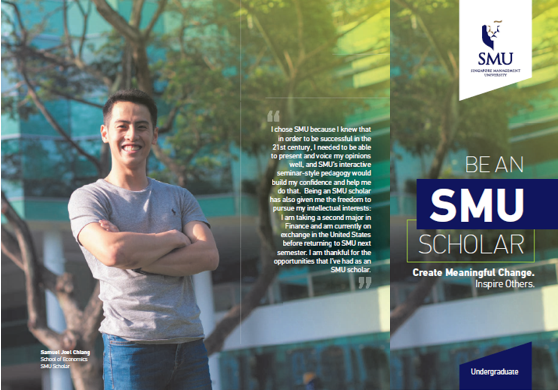 SMU caught up with Toshin to find out firsthand how he beat the odds to successfully secure the scholarship. Q: Congratulations! How did you feel when you were informed that you had secured the Schwarzman scholarship? Thank you! I was absolutely elated when I received the offer to be a Schwarzman Scholar. It was truly surreal and even now, the feeling hasn’t fully sunk in. I’m excited for what lies ahead but more than that I’m incredibly grateful for this opportunity and for the people who have supported me along this journey. Q: Schwarzman is stringent in its selection of scholars. Could you describe the application process? The scholarship application required much thought and was fairly time consuming. I remember spending more than 20 hours at a stretch, on multiple occasions, writing my essays and preparing my video introduction. What made it all the more challenging was balancing all my other work as well, since the application was due in a busy phase of our SMU semester. As I pieced together my scholarship application, I faced a number of challenges. Firstly, there was no point of reference as successful candidates are not allowed to share their application materials. Secondly, I didn’t personally know anyone who had been selected for the programme so it was difficult to get a good understanding of what the application experience was like. I reached out to a number of former scholars through LinkedIn, many of whom were incredibly helpful in giving me tips and insights that enabled me to put my best foot forward. At the end of the day, I think there’s no real substitute for hard work, though it’s also incredibly important to be self-aware and work smart. All in all, I learnt a lot about myself through the selection process for the programme. I was particularly inspired by many of my fellow applicants whom I had the pleasure of getting to know in Bangkok as well. It’s evident that a lot of thought has gone into how the process has been structured and despite its challenging nature, I think that the entire process is extremely worthwhile. Q: How do you think your experiences at SMU contributed towards your success in securing the Schwarzman scholarship? My experiences here at SMU over the last many years have shaped me into who I am today. Without the opportunities that SMU has provided me with, I would not be selected as a Schwarzman Scholar. I was first exposed to public policy as a field of study here at SMU and I now intend to pursue a career in it. Additionally, the university has provided me with multiple opportunities to hone my leadership skills, gain international exposure and acquire practical skills. More than anything, I have met many incredible individuals here at SMU who inspired me to give my 100%. There are two individuals in particular who come to mind. The first is our outgoing President, Professor Arnoud De Meyer. Having been elected to SMU Students’ Association (SMUSA) as a freshman, I’ve had the privilege of knowing President De Meyer on a personal level for nearly four years now. I’m amazed by how he takes out time to be present at almost every event despite his busy schedule. His commitment to his values and unfettered support of student life at SMU has been nothing short of inspirational. The second person that has inspired me is one of my personal mentors, Mr. Wong Yew Tong from the Office of Student Life. A former Olympian, Yew Tong has taught me the importance of humility, the power of emotional intelligence and what it truly means to be a leader. He has always supported me through my student leadership journey and I am incredibly grateful for all that he has done for me. 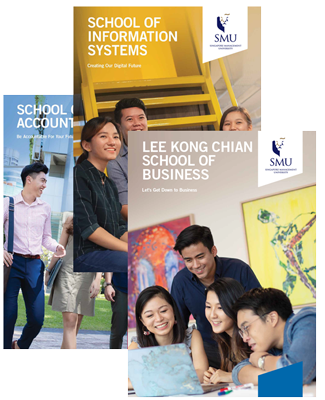 Q: The Schwarzman Scholars Programme is “designed to prepare the next generation of global leaders.” How has SMU enabled you to develop your leadership skills? SMU has provided me with a wide array of opportunities to hone my leadership skills. As an elected member of SMUSA, SMU’s highest student leadership body, I’ve had the chance to represent my peers and advocate their interests for two years. As the President of SMU International Connections (ICON), a standing committee of SMUSA I learnt to lead a multicultural team with members from over 13 different countries. The vibrancy of student life and student leadership here at SMU is unparalleled. I’ve been provided with tremendous opportunities to grow and develop myself through the Diversity, Inclusion and Integration Unit of The Office of Dean of Students and the Office of Student Life. On the international stage, I’ve had the pleasure of representing Singapore through SMU at the United States Military Academy at West Point, New York. At the end of 2018, I’ll be speaking alongside titans of government and industry including our Speaker of Parliament, Mr. Tan Chuan Jin at the SMU Leadership Symposium. Q: What learnings did you draw from your experience as a Student Career Coach and Ambassador (Career Champion) at SMU? As Career Champions, we’re trained by Dato’ Kho Hui Meng Career Centre (DKHMCC) to critique resumes and conduct mock interviews. We also have the privilege of meeting several employers to understand the changing needs of various industries. The resume writing and interviewing skills that I picked up as a career champion were incredibly useful to me during the selection process for the programme. Additionally, an understanding of various industries helped me provide a more holistic perspective on issues during my interview. Q: What drew you to study economics at SMU? Quite a number of factors! Firstly, Singapore for me is the perfect blend of Asian and Western culture. I loved the idea of seminar-based classes and the focus on experiential learning that SMU had to offer. 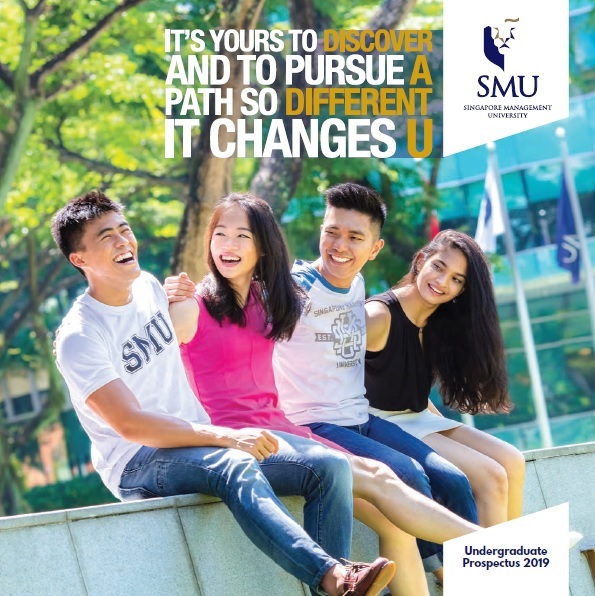 I was fairly certain I wanted to study economics at the time and the fact that SMU offered a Bachelor of Science degree appealed to me greatly. My sister, Tilottoma (BBM, 2013) had a fantastic time here at SMU as well. Given all these factors, it seemed like a no-brainer to choose SMU when I got the offer. Q: You’ve described yourself as an “aspiring policymaker”. Can you tell us more? As a public policy student, I’m deeply interested in how we can make our world a better place. My ideal job as of now, is one in which I can understand contemporary challenges and help governments around the world to formulate and execute policies that will enable them to alleviate poverty and maximise the welfare of their citizens. I hope to play a key role in stimulating international development by leading intergovernmental organisations such as the World Bank in the future. Q: Is it all work and no play for you? What do you do in your free time? I love acting and I’ve had the chance to perform in a number of professional and student theatre productions. Last year, I played the lead antagonist in SMU Komunitas Indonesia’s annual play, GAYA 2017 held at the National Drama Centre. I’ve had the pleasure of performing for a number of productions, including a couple for Emmy Award winning director Dr. Kaizaad Kotwal. To be honest, my ‘free time’ is invested in co-curricular activities (CCAs) such as SMUSA and ICON. I find serving in student government extremely fulfilling. My student leadership journey through these CCAs has moulded me into who I am today and I wouldn’t be a Schwarzman Scholar if it weren’t for the lessons I’ve learnt along the way and the wonderful people that have supported me. I’m ever grateful to my peers and mentors for everything that they have done for me. Schwarzman Scholars, one of the world’s most prestigious graduate fellowships, located at Schwarzman College at Tsinghua University in Beijing, today announced its fourth class. 147 Schwarzman Scholars were selected from over 2,800 applicants. The Class of 2020 is comprised of students from 38 countries and 119 universities, with 40% originating from the United States, 20% from China, and 40% from the rest of the world. The Class of 2020 will enrol in August 2019. Beyond the classroom, Scholars will gain unrivaled exposure to China and a broad network of important relationships through unique internships, mentorship opportunities, high-profile speakers and opportunities to travel throughout China. Scholars will also have access to career services support that will help prepare them to make the best of their time in Beijing and beyond. This combination of coursework and cultural immersion will provide students with a first-hand, in-depth understanding of China, critically important to leading in the 21st Century. Read more about the Schwarzman Scholars Class of 2020 here.